A beautifully packaged, well-behaved fountain pen ink, but don't believe the colour on the label! Have you ever picked up a new fountain pen ink on impulse? Especially without looking at samples or researching online reviews? I did that recently and the results were disappointing. I was, as many stationery enthusiasts do, browsing around one of my favorite local pen shops, Nikaido, and decided to investigate the newer line of Kyo No Oto inks that they carry. These inks are presented nicely in a white cardboard box with the name of the ink and a color swab showing a wide range of ink shading on the label. A small and subtle letterpress styled logo and symbols show the manufacturer’s name at the bottom of the box. I originally bypassed these inks when they first came to market as they appear to be more muted in colour than my usual preference. 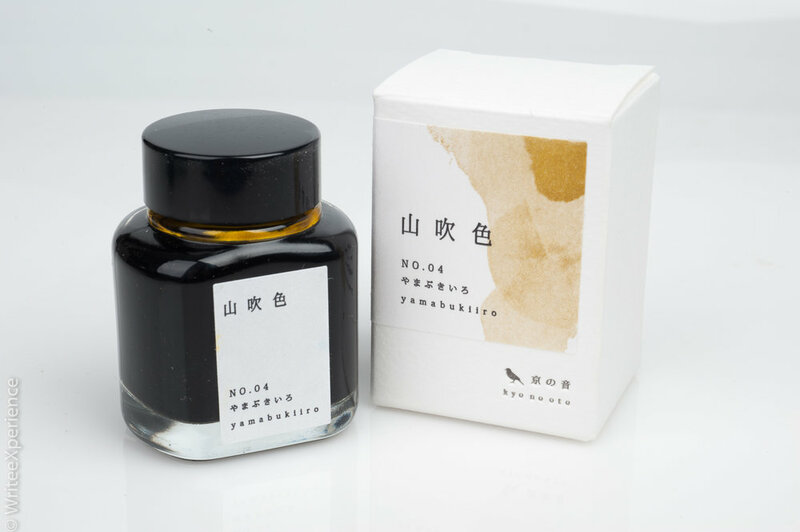 But Yamabukiiro ink that I chose had an interesting colour range - looked kind of look like coffee on paper, soft brown to darker brown as the shading became darker. Nikaido does not have ink swabs, so I based my choice solely on the color shown on the box. This was in hindsight a mistake. Kyo No Oto inks are not cheap - I paid around $30 Canadian for this 50ml bottle which makes it twice the price of Diamine and 20% more expensive than the wonderful Robert Oster Signature inks. My expectations were accordingly high. I filled a Sailor Pro Gear Slim with this ink. The nib is an EF (extra fine), but the pen is the smoothest Japanese EF that I own and writes very well. Perhaps the choice of fine nib affected some of the attributes of this quite muted ink. A swab test and a dip pen test show consistent colour, even if the shading is not visible with the finer nib. From the first stroke of the pen, I was disappointed with the ink. instead of the beautifully subtle coffee tones I was expecting, the ink wrote in a sickly, snotty yellow / green shade. On the Rhodia Webbie paper I was using, this almost blended into the background - which, I admit, is also because of the EF nib with which I wrote. I felt that the color wasn't the same tone of color that I was expecting from the label sample. Surprisingly, the difference is much less noticeable (and much more attractive) under colour balanced studio lights, but very noticeable in daily writing and normal lighting conditions. I was very disappointed with the color and would not have purchased it had I seen an accurate color sample. I was especially disappointed because of the cost. It is one of the few inks I have dumped out of a full pen. While the color is perhaps the most obvious criteria for judging ink, the behavior of the ink is also very important. Despite my small sample size, of just one ink, my experience with this may provide some useful information on the ink link. The ink is very well behaved. Despite the EF Japanese nibbed fountain pen I had no problems with ink flow or hard starts. Dry time was great and the ink laid down well on the page. I tried the ink on a variety of papers and found that it was predictable and trouble-free on all of them. Despite my disappointment with the ink being a different tone of colour than the packaging implied, the ink does write well. I don’t like the actual colour as the tone is different than I was hoping for. Unfortunately, the combination of expensive ink and misrepresented colours leave me disappointed. I can’t say whether it is only this ink, but I can’t recommend this line of inks unless you see a swab or get to try it for yourself. If you do like the colours, the ink is nice. I would be unlikely to purchase another bottle sight unseen or recommend them to anyone, especially at the premium price point. Luckily, there are lots of ink vendors on the market at the moment and many are much more affordable.